Hello after almost 2 years! I just came back from my hibernation haha. It's been 2 weeks since I started to look into Korean again and I honestly don't know how long it will last. Funny thing is the thing that triggered my come back (ohh, 'come back', feeling like a Kpop artist~) is, again, Running Man (I started learning Korean because I loooove Yoo Jae Suk)! When I visited my family in Surabaya, Indonesia, my aunt watched the show and before I know it I open my books again. Anyway, this time I'll try different ways. I easily get bored, lack of focus and do not have a very strong will. I am now looking for the best method for me to learn Korean and I want to try this TWIK or This Week In Korean or This Week in (my) Korean (learning journey) ㅋㅋ. On TWIK, I want to log my daily touch with Korean, anything or nothing, it's also ok. I'll make a post each week and update it daily. 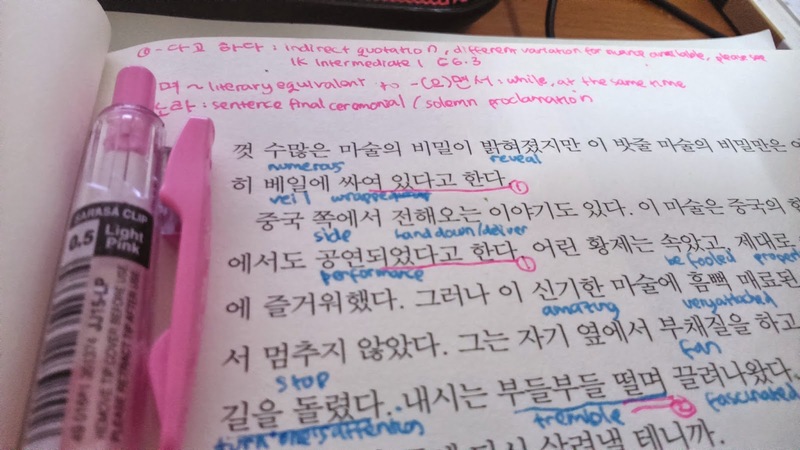 I listened to TTMIK level 4 lesson 8. I was too tired to study after working. So I set the alarm and went to sleep. When I woke up in the middle of the night, my sister was already asleep (we share one room in a boarding house) and I didn't want to turn on the light, so back to podcast, I listened to TTMIK level 4 lesson 9 and 10. After reading Korean Vitamin's post, I bought Everyday Korean Idiomatic Expressions from Google Play Store, ebook version (it's even cheaper than the price at the official store!). I think it's quite handy because the book can be a fun read, I can read it on my way to work (though reading it in small screen is not that comfortable) and I can have something light to study on unearthly hour. On my way to work I listened to TTMIK level 4 lesson 11 and 12. Lesson 12 was about -아/어 보다 (to try doing something). I like that 물어 보다 (to try asking) is more commonly used than 묻다 (to ask). 물어 보다 seems to be more polite and more smooth(?). It's so commonly used that Naver has 'to ask, to inquire' as definition for both words (물어 보다, 묻다). In the evening, I reviewed vocabulary I just learned from Korean Grammar in Use Intermediate chapter 2.1, -기는 하지만, -기는 -지만. One of the word/idiom was 마음에 들다 which means to catch one's fancy. But which 들다 definition forms the expression? Found four definitions in Naver dictionary but 아무것도 마음에 안 들다. ㅎㅎDid I use that right? Now as I'm writing this and checking Naver again, I think the 들다 in 마음에 들다 is 'to hold/take'. To hold something in mind/heart. Sweet. 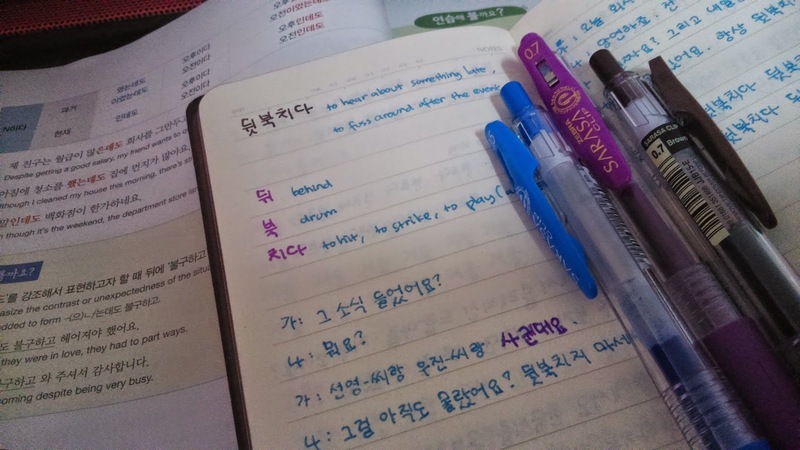 I listened to TTMIK level 4 lesson 13 and 14. I'm starting to love word builder series because I always have a problem memorizing vocabulary (I don't remember having this problem with English perhaps because I didn't pay that much attention to my progress and that's why I didn't get frustrated haha). Also, Hanja and Kanji and Chinese characters have long intrigued me. 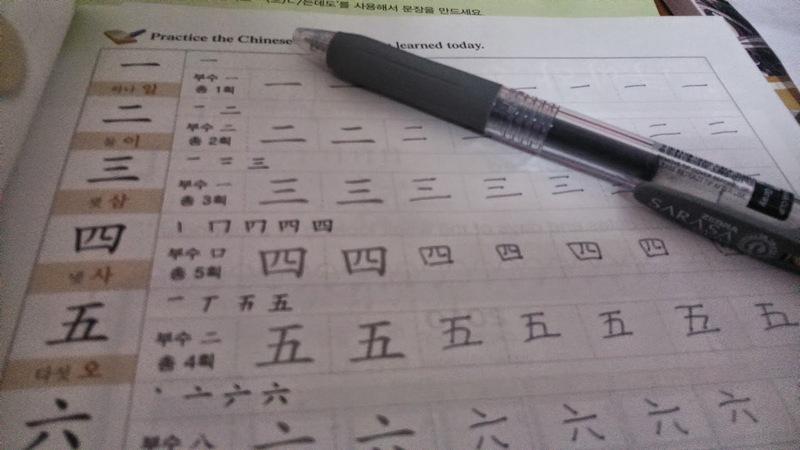 Some people say that it's easier to learn Korean vocabulary with the help of their knowledge of Kanji or Chinese characters. I always wonder why it is. I don't know Japanese or Chinese language. So, today I bought another book by Darakwon, Useful Chinese Characters, from Yes24 Indonesia. Can't wait. I watched episode 1-3 Arirang's Let's Speak Korean and reviewed few words from KGiU Intermediate chapter 2.1. I learned another way to express contrast, -은/는반면에 from KGiU Intermediate and the first idiomatic expression from TTMIK book. Hm, my impression on the first week.. so far I really enjoy it. Sometimes I think about how slow my progress is and how little I learn each day but I really don't mind it. I know I have to choose between giving more efforts and enjoying the process. And I think if I cannot enjoy it, will I really learn? How much of it will stay on my head and will I ever be able to use it? Everyone is different and I just have to find and do learning method that suits me best.